Dress For Success is a non-profit organization that promotes the economic independence of disadvantaged women by providing professional attire, a network of support and the career development tools to help women thrive in work and in life. This year, their chapter has a goal of suiting 400 women. On Sunday October 17th, I will have the pleasure of producing their 3rd annual charity fashion show at the Tremont Grand Hotel. Last year was a big success with host, educator, and author Al Reynolds; motivational speaker Debbie Phelps; and Miss U.S. Beauties Juanita Ingram, extending their time and effort to help the women of Dress for Success. 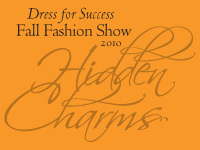 This year’s theme is “Hidden Charms” because there are so many women in “Charm City” who have suffered setbacks in their lives and have lost the confidence to achieve their career goals. We will showcase some of these women and give them the opportunity to be part of this fabulous fashion show. They will be “made over” and get to walk the runway — giving them a boost of confidence that most of these women haven’t felt in a long time. Currently I am looking for models as well. If you are interested in participating, please email me at sdecaires@gmail.com for more information. I will need pictures, experience, contact info, and measurements. Thank you for your interest. Will be in touch if needed.